Navigate to the Me tab of the Homebase Resident App. On the first of each month the amount at the top of the Payment Balance screen will show the balance due. Note: Before the first of the month this amount will display $0.00. 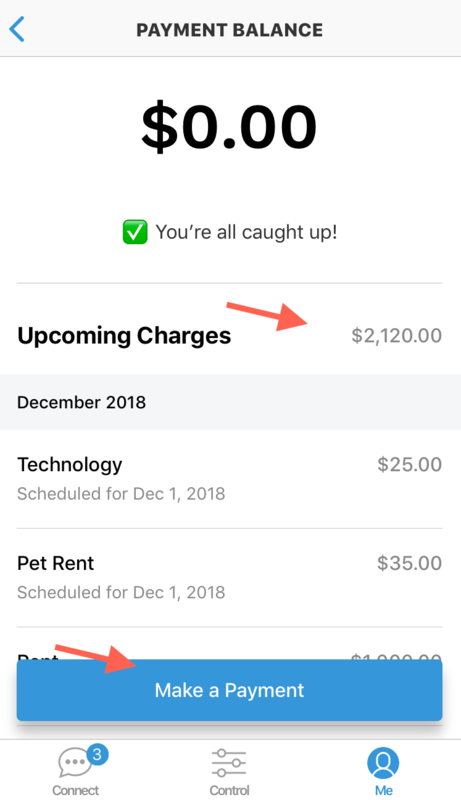 Upcoming Charges will show your balance for the next payment period. Scroll down to see the list of charges and credits included in your balance. Select the Make a Payment button. View, confirm and edit the Payment Amount. To edit the Payment Amount, tap on the payment amount value shown to bring up the keyboard. Use the keyboard to enter the payment amount. Select Done on the keyboard and then select the Continue button. Confirm the amount you'd like to pay, select I Agree and the Submit Payment button to send your payment.